The .NET Gadgeteer is an open-source toolkit from Microsoft that enables you to build small electronic devices programmed using the .NET Micro Framework and Visual Studio or Visual C# Express. Even without any knowledge of electronics, you will be able to quickly construct devices from a kit of peripherals such as sensors, lights, switches displays and many more components. The system hardware is composed of a mainboard, containing an embedded processor, and a separate collection of modules. Modules are connected to the mainboard using a cable to connect a socket on the module with a corresponding one on the mainboard to create your working device. For writing software, devices are programmed in C# using the .NET Micro Framework. You can correct your programs while they are running on the device which makes debugging the device a lot quicker. 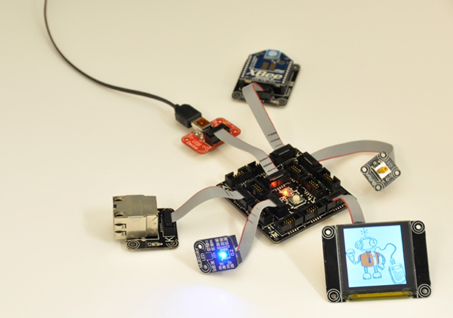 The first commercially available .NET Gadgeteer compatible hardware is the FEZ Spider Starter Kit from GHI Electronics. It's currently priced at $249.95 and available to pre-order but not due for first shipment until 30 September 2011.